Florida is now the third most populous state in the nation. How do we envision the future of the state? Moderate projections indicate that by 2070, Florida’s population will reach approximately 33.7 million residents, close to 15 million more than in 2010. The Florida 2070 report aims to raise questions such as; what happens if Florida continues to develop as it has in the past? Florida 2070 is a joint project of the Florida Department of Agriculture and Consumer Services, the GeoPlan Center and 1000 Friends of Florida. The partnership was formed to developing a series of GIS-based state and regional maps to explore the challenges presented by a growing state. The study includes a series of statewide and regional maps for three scenarios: 2010 Baseline, 2070 Trend emphasizing current development patterns and 2070 Alternative with a more compact pattern of development and increased protected lands. The scenarios are based on current data and data-based projections, drawn from a collection of academic and professional organizations, including the GeoPlan Center’s FGDL. 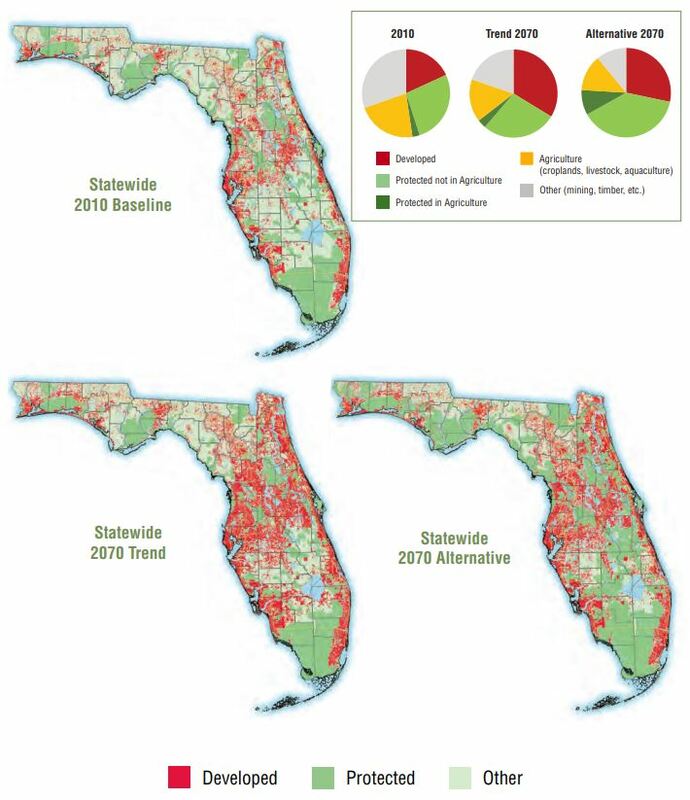 The resulting report and visualization of Florida 2070 uses map graphics to illustrate the impacts of population increase and associated development on land use and water needs. Florida 2070 is intended to foster a research-supported discussion on how current public policy and local choices might impact the future. The project outcome shows the value of using scenario maps to illustrate a future to the public. You can read about the intention and communication surrounding the project in this coverage by the University of Florida.